Late last year, word broke of a new line of RDF™ (Reduced Drag Factor) bullets featuring very high Ballistic Coefficients, hybrid-type ogives, and tight, factory-closed meplats. Nosler’s new RDF bullets promised to be very competitive match projectiles for their respective bullet weights, based on initial specs and their billing as “the highest BCs and smallest, most consistent meplats on the market”. But would they perform as advertised? 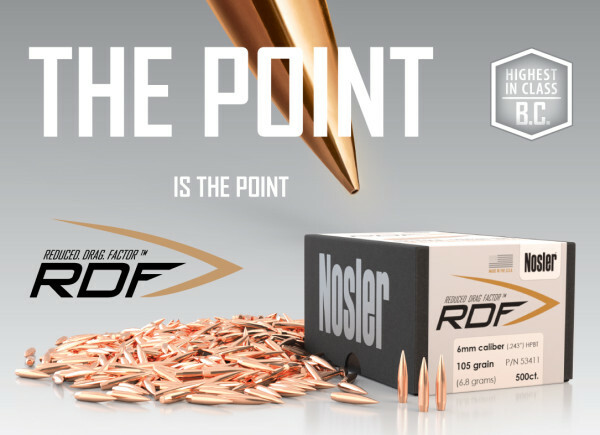 Since their introduction, the Nosler RDF line have become very popular, offering excellent performance for the price. Shooters, particular PRS competitors, have found the RDFs deliver the flat trajectory and high BC necessary to reach the podium. 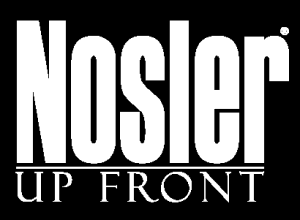 There are now rumors that Nosler will expand the RDF line (which currently includes four calibers/bullet weights) to include new calibers/weights in 2018. However an official announcement is still forthcoming. Nosler designed the RDF bullets to have very high BCs for flatter trajectories and reduced wind drift. Nosler achieved high BCs by adopting a modern hybrid-type compound ogive, which bridges traditional tangent and secant bullet shapes. This hybrid shape is less sensitive to bullet seating depth than a pure VLD-style, secant ogive shape. That allows hand-loaders to seat away from the lands and still get excellent accuracy, which can be maintained even as the throat moves out over time. RDF bullets also feature a long boat-tail for aerodynamic efficiency. Compared to conventional match bullets, Nosler’s RDF bullets look quite different because the tips have been tightly closed up at the factory. Nosler promises a 40% average reduction in meplat size vs. conventional hollow-point bullets. Hand-loaders no longer need to point and trim tips, a laborious task to improve BC and make BCs more consistent for every bullet in the box. Consistent BC translates to reduced vertical spread at long range. What can you expect on the firing line with Nosler RDF bullets? If you’re a skilled shooter who can capitalize on reduced drag and increased consistency from your ballistics, you should see less wind drift, and reduced vertical dispersion at long range. That translates to tighter groups and higher scores in competition. That’s all good. And when you compare the cost of Nosler’s RDF bullets with other match projectiles, you may be pleasantly surprised. Share the post "Nosler Delivers High-BC, Closed-Meplat RDF Match Bullets"
The Nosler RDF bullets have not panned out for me. They may be good enough for PRS competition, but I’ve found they are not good enough for F class. I shoot F-TR and tried the 30 cal 175 gr bullets. I found that I was struggling with vertical throughout a 20 shot string. With the same powder charge I get very consistent vertical with Sierra 30 cal 175 gr and Berger 30 cal 175 gr LR BTHP bullets. Maybe I need to try different powder charges or maybe I need to wait for Nosler to improve their QA/QC on these bullets. In any event, 4 to 5 flyers per 20 shot string makes for a frustrating day shooting matches.